Neighbors, students, farmers, conservationists, children, elders, affected land owners, small business owners, politicians, artists, faith leaders, musicians, lawyers, climate activists, builders, poets, climate justice organizers and hundreds, if not thousands, of individuals came together united around one common goal: The Kinder Morgan NED fracked gas pipeline will never be built! 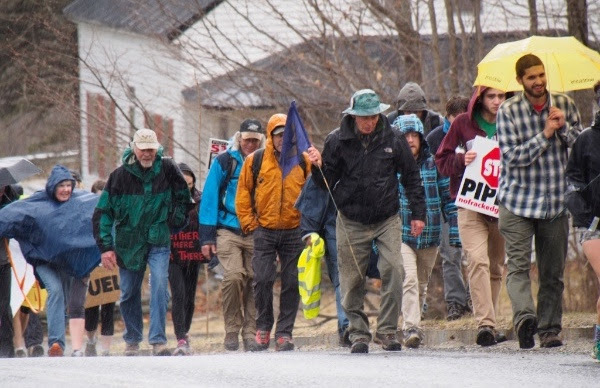 From day one our community in Western Mass knew something that Kinder Morgan could not see: our long and storied history of successful resistance to injustice and exploitation by corporate outsiders. United by a love of the land and a passion for a livable future and in powerful collaboration with others across the state and region, people organized on every front: legal, political, educational, and regulatory; at the local, state and federal level; through direct actions including walking the proposed pathway, organizing rallies, overflowing the halls of numerous hearings, building a Thoreau Cabin in the pathway of the pipeline, ongoing vigils and active preparation for massive non-violent civil disobedience with the support of a brilliant legal team. While remaining mindful of new twists and turns, we know that for now one toxic and completely unnecessary fossil fuel infrastructure project has been blocked. While celebrating our success, we need to continue to focus our energies on the bigger picture: the need to stop the many other proposed fossil fuel projects that remain. This includes our fight to protect public lands threatened by the CT Expansion pipeline in Sandisfield, to block the Spectra pipeline in the eastern part of Massachusetts, and to stand together with those in New York who are resisting the Constitution Pipeline. Preventing climate catastrophe binds us together as never before in human history. It is only by working together on a global scale that we will prevent the extinction of life on earth. This, the call of our times, contains a paradoxical gift: to prevent climate catastrophe we must find new ways of occupying planet earth that are grounded in equity, justice, respect and love.